The manager of oil and gas sales for the Islamic State, Sayyaf was killed in an attempt to capture him by U.S. Delta Force commandos, near the oil fields south-east of Deir ez-Zor, on the 16th of May 2015. Two months later, the details are finally emerging via Amir Musawy. 70 or 400 or 500 [or 700 or 750]? Yesterday, Südwestrundfunk (SWR) reported that the Islamic State leader’s stash comprised more than seventy ‘carefully-wrapped/carefully-boxed antiquities and Islamic artworks…, amongst them apparently pieces from the museum in northern Iraqi Mosul that was plundered and destroyed by IS [sorgfältig verpackte Antiken und islamische Kunstwerke…, darunter offenbar Stücke aus dem zuvor vom IS geplünderten und zerstörten Museum im nordirakischen Mossul]’, as well as ‘antiquities from Syria itself [Antiken aus Syrien selbst]’. 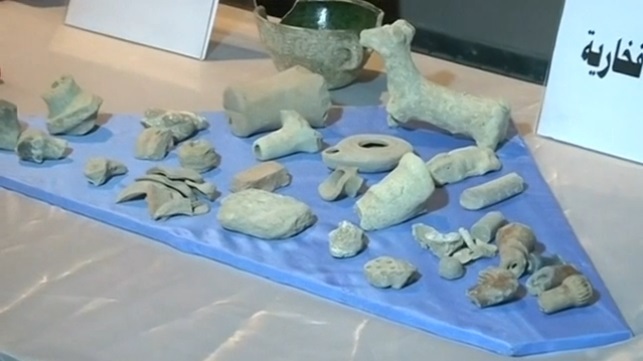 Curiously, today, [the Washington Post stated that Iraq had regained ‘more than 400 ancient artifacts’ through that raid, while] the Associated Press stated that the National Museum of Iraq in Baghdad had regained ‘nearly 500 artifacts‘, “many” of which had been ‘stolen during the 2003 U.S.-led invasion’, some of which had been looted over the course of the following years. Eventually, somehow, thereafter, they all ended up in ‘the hands of Islamic State extremists and were smuggled out of Iraq into Syria’. Were first 70 presented, then another 430? 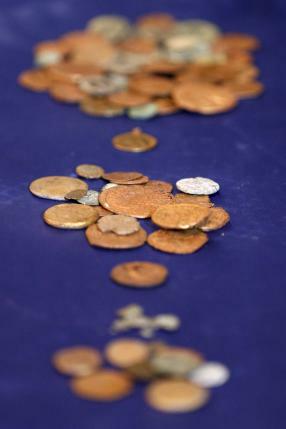 Did the 70 count as parts of a whole (beads of a necklace, coins of a hoard, etc.) things that the 500 counted separately? 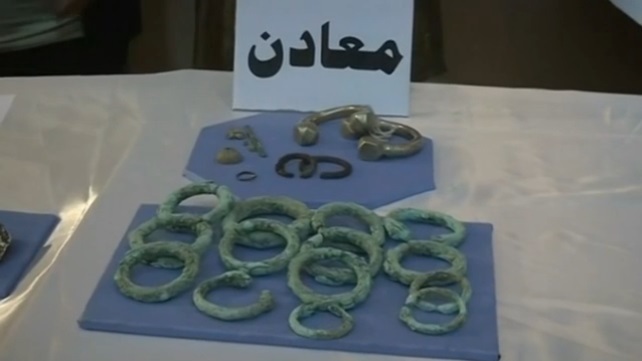 Did the 500 include antiquities that had been recovered in other operations? Regardless of exactly how many of those antiquities had been looted from the National Museum in Iraq, it is significant that any long-ago-looted antiquities from Baghdad Museum were acquired, smuggled and stored in an Islamic State paramilitary base in Syria alongside recently-looted antiquities from Mosul Museum. Were they sold to the Islamic State by a stockpiling dealer who had acquired them and stashed them for years or by a powerful collector who finally found himself on the wrong side of power? Were they “expropriated” (stolen) from the illicit handler by the Islamic State? 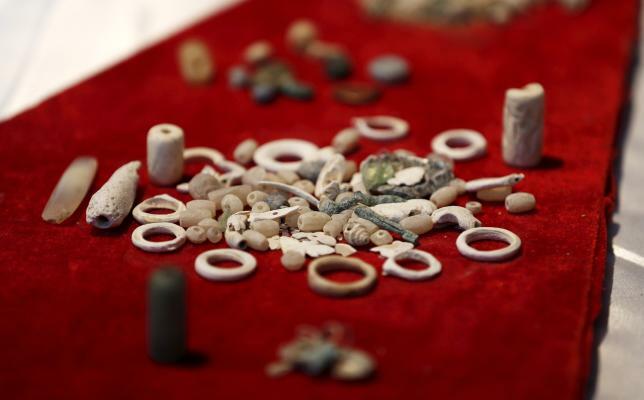 Reuters listed finds such as ‘ancient cylindrical stamps, pottery, metallic bracelets and other jewellery, and glass shards from what appeared to be a coloured vase’ [which may be seen in Vivian Salama’s photo below] as well as ‘early Islamic coins‘, while the Associated Press noted ‘royal seals used by kings in the ancient Assyrian city of Nimrud‘. Paul Barford noted something else – a ‘fake Nefertiti head’. How many other objects are fakes? Since some of the antiquities were looted from Mosul Museum, it appears that the Islamic State did loot the museum before it recorded the propaganda video of iconoclasm, and is using its ethnic/religious cleansing as a cover for its financing mechanisms. (I’m not denying that it is ideologically committed to cultural destruction, but it is denying that it is engaged in cultural racketeering.) Regardless of the course of events at the museum, these antiquities had evidently been stored for sale rather than destruction. 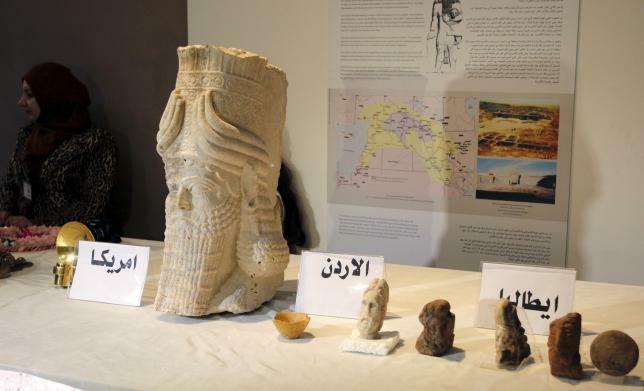 It also demonstrates that the Islamic State’s antiquities operations are internally complex, as not only Syrian antiquities but also Iraqi antiquities were stashed with a manager of other illicit commodities in Syria. 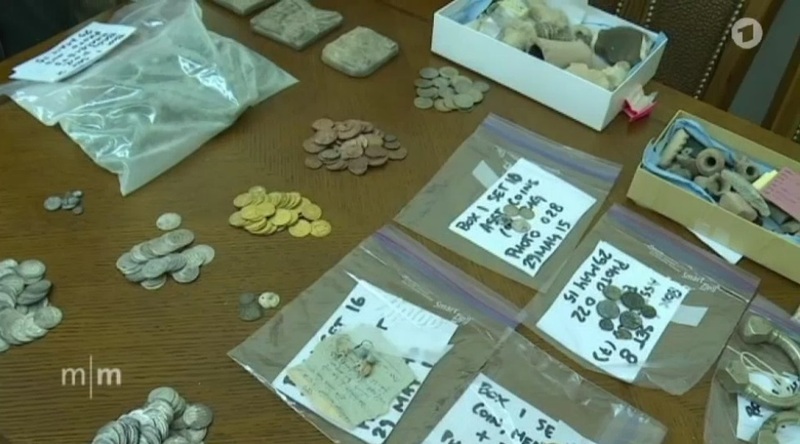 And that stash was in a different section of its territory in Syria from its antiquities administration (Diwan al-Rikaz) in Manbij, which apparently ‘manages loot[ing] and sales‘ – though it has local offices elsewhere too, including at (one of) the source(s) in Mosul. The evidence is not merely complex but confusing. 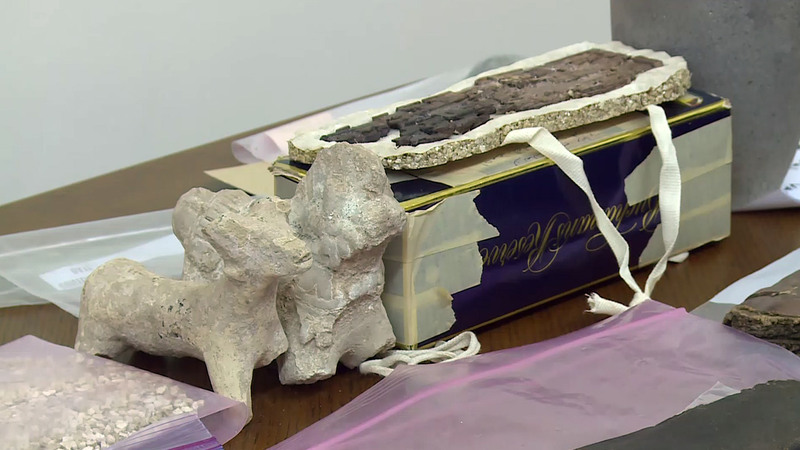 Had the antiquities from Baghdad been stashed in Mosul? 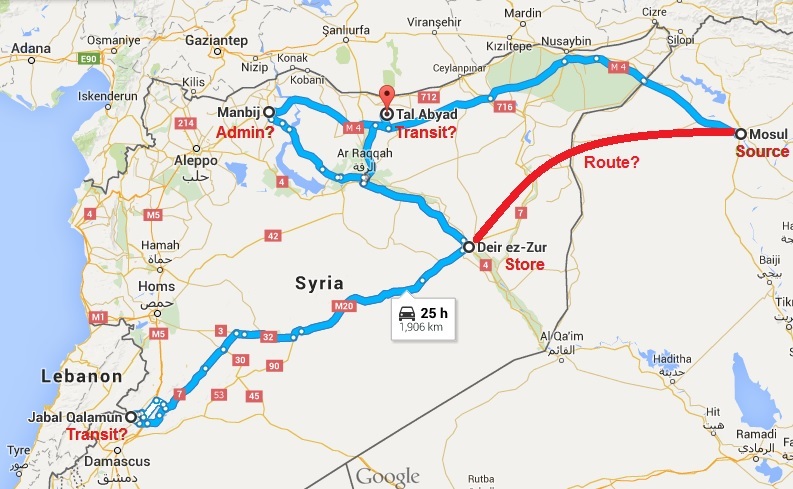 Were the antiquities smuggled from Mosul (and elsewhere, then assembled) and administered in Manbij, then trafficked to Deir ez-Zor, in order to be trafficked north to Tal Abyad and smuggled into Turkey or trafficked west to Qalamoun and smuggled into Lebanon? 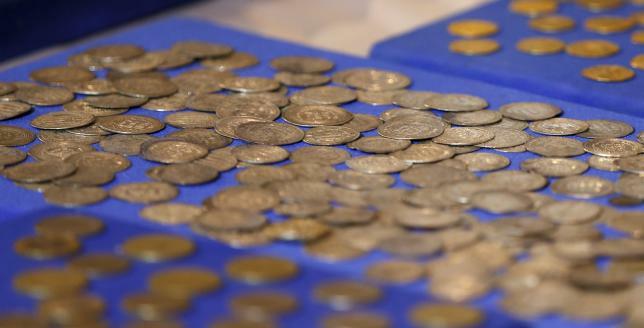 Were the antiquities destined to be smuggled onto the market by another route? Had the antiquities been smuggled directly from Mosul to Deir ez-Zor? Update (16th July 2015): A paper trail? 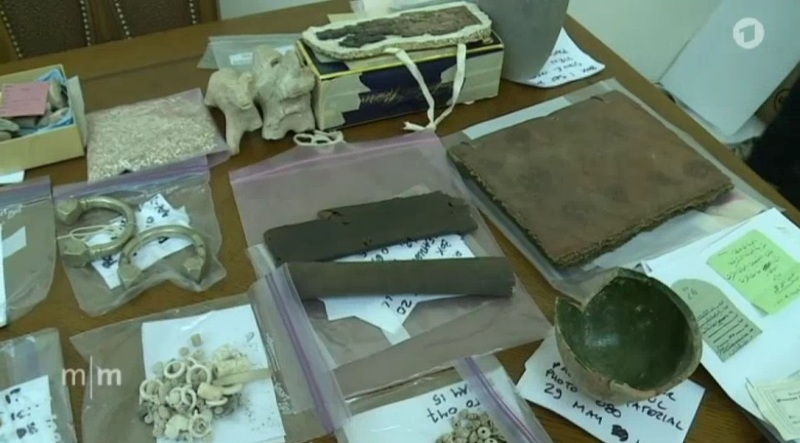 Loveday Morris also relayed that “receipts” alongside objects ‘documented illicit sales dating to the 1980s, suggesting that if they were Abu Sayyaf’s, he may have been in the smuggling game for decades’. If they are genuine, it will be grimly amusing that traffickers in Deir ez-Zor keep better records than dealers in London. But would a mobile terrorist mastermind really carry his thirty-year-old sales receipts around with him, especially when his potential buyers show so little interest in seeing them, let alone acquiring them along with the objects? Perhaps someone could suggest to U.S. Ambassador Stuart Jones that he’s laying it on a bit thick by informing the Iraqis, ‘Daesh is stealing your antiquities, and we are giving them back to you’? Update (16th July 2015): laying it on thick indeed – too poor to be propaganda? Portable Antiquity Collecting and Heritage Issues’ Paul Barford has done a sterling job of picking out copies, fakes and freaks, from the plaques to the miniature Nefertiti bust to the metal foundry’s smelting crucible. There are so many holes in the story and loose ends that it is only natural to be suspicious. However, I think that – if it were a U.S. or Iraqi propaganda exercise (beyond PR) – the evidence would have been less rubbish. 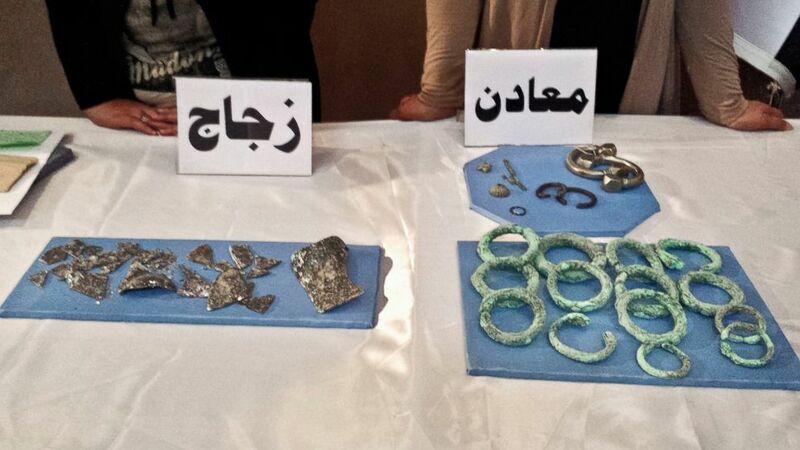 Is this a cache from a forgery workshop in northern Iraq? 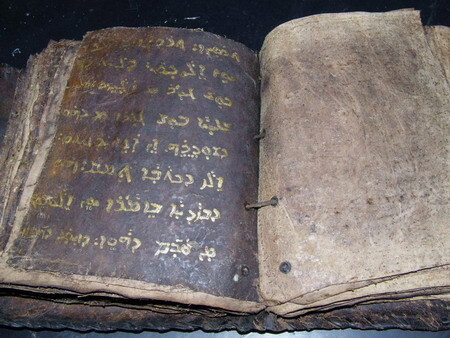 Loveday Morris was told that a ‘leather manuscript, written in ancient Aramaic‘, had been ‘seized by US forces during the Abu Sayyaf raid in Syria’ as well. 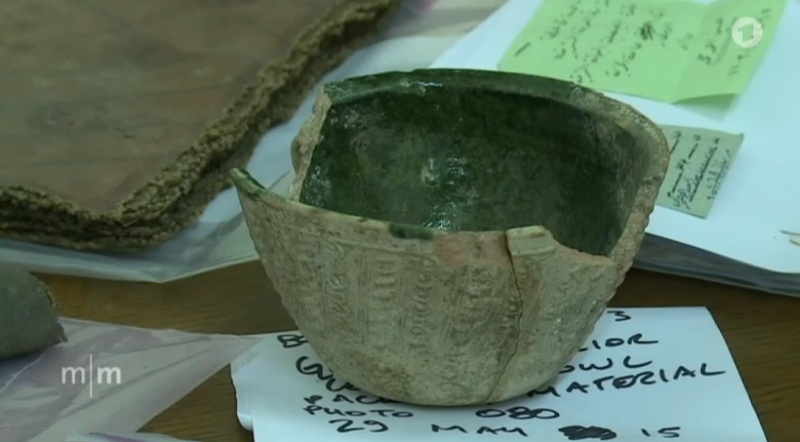 ‘An official at the National Museum of Iraq in Baghdad said Wednesday that it was about 500 years old but has not yet been properly dated.’ I think this may be a particularly instructive find. 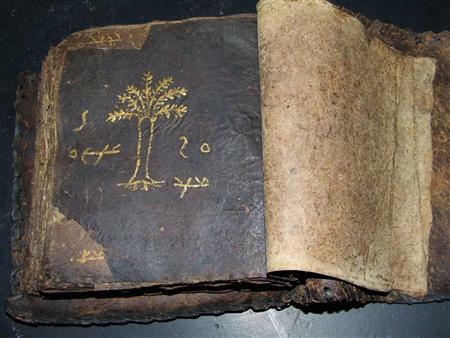 It may help to compare it with a Syriac bible that was probably stolen from south-eastern Turkey and smuggled into Cyprus in 2009, which Byzantinologist Charlotte Roueche and Syriac linguist J. F. Coakley thought might be genuine(ly 500 years old, not reportedly 2,000 years old), Biblical scholar James Davila thought might be modern, Aramaic translator Steve Caruso thought was ‘probably either a work no earlier than the 15th century, or a modern forgery‘, and Aramaic and Syriac lecturer David G. K. Taylor judged to be ‘one of a large number of fake Syriac manuscripts currently being produced in northern Iraq and southern Turkey’. The book in Syria has a fairly uniform, deep and wide darkening along the vertical edge of the page, which the book in Cyprus does not. 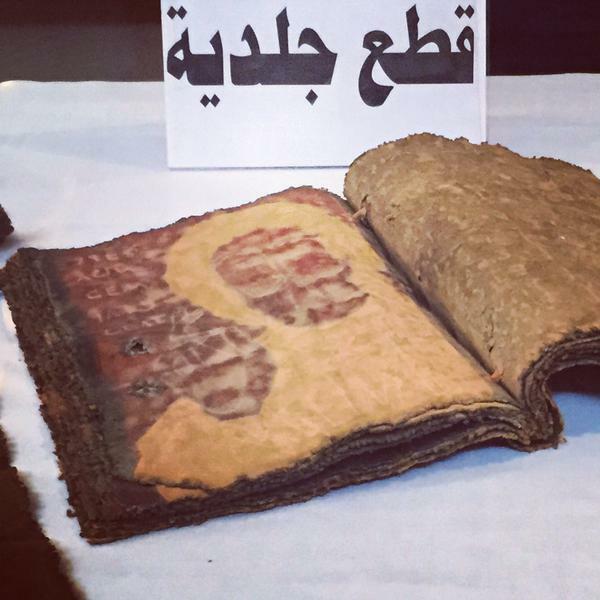 The book in Syria appears to have something like a bullet hole of a cigarette burn. And the “Syrian” book’s painting of a figure with a raised right hand appears to have been reduced to a ghostly stain on the page, whereas the “Cypriot” book’s artwork is still clear. 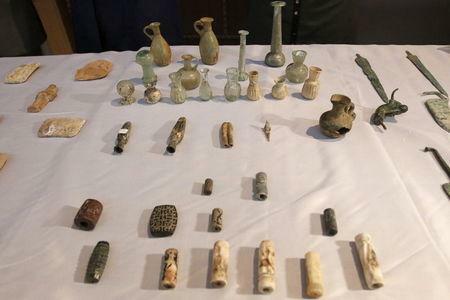 Obviously, some – perhaps most – of these objects are genuine antiquities, and some of them can even be traced back to individual episodes of theft. But some of these objects seem to be forgeries. And one of the notorious forgery industries is in the same place as one of the confirmed sites of theft. Could they have been assembled and shipped from Mosul? 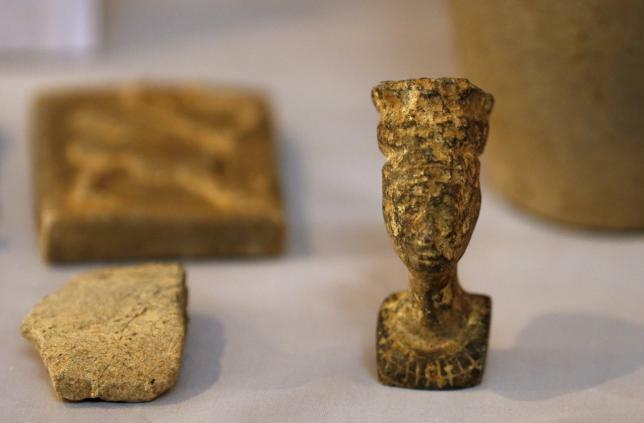 Recovered antiquities are displayed at the Iraqi National Museum in Baghdad, Iraq, Wednesday, July 15, 2015. 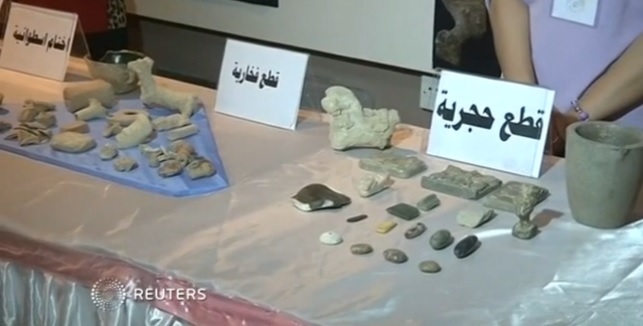 Nearly 500 artifacts recovered by U.S. Army commandos during a recent raid in Syria targeting the Islamic State group were displayed at the Baghdad National Museum Wednesday after being returned to Iraq. 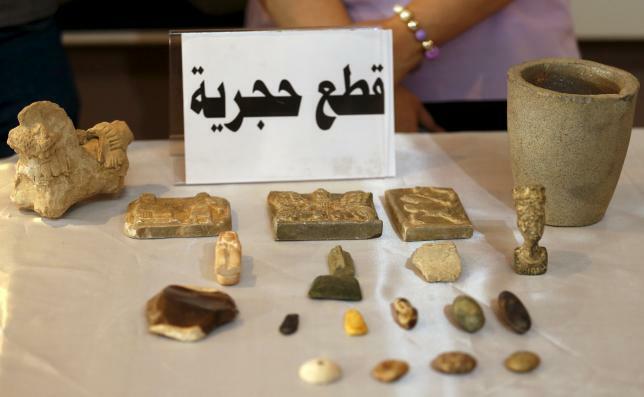 Recovered artefacts are seen at the National Museum of Iraq in Baghdad, Iraq July 8, 2015. I think I bought a similar Nefertiti head in the gift shop of the Altesmuseum in Berlin three years ago. Only mine was plaster instead of stone. Same size and shape.